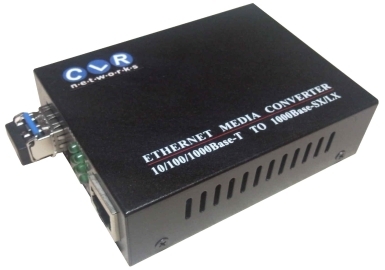 The CLR-MCG-SFP is a copper to fiber optic Gigabit Ethernet Media Converter which converts 10/100/1000Base-Tx to 1000Base-Fx. Copper connection is provided with RJ45 port, and the fiber optic connection is provided with an SFP module. Either singlemode (LX, ZX) or multimode (SX) SFPs are supported. It can extend the distance of communication up to 80km through ZX SFP module. This standalone converter is unmanaged. There are 6 LEDs indicating the working conditions of converter which gives the users the ability to fully monitor status and diagnose the failures.